The city of Pokhara is on a lake; as best I can discern the name of the lake is Phewa, maybe Fewa, but is could also be a manmade lake as there is a Dam on the lake. 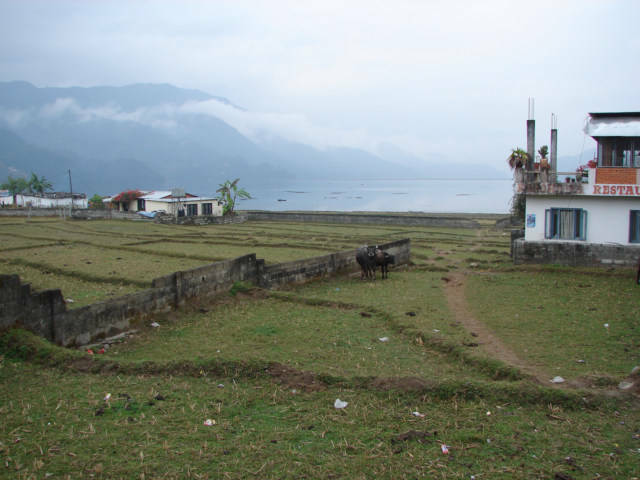 The Hotels of Pokhara though are not really, on the lake, there is many Rice Paddies on the lake. I do believe when sunny and green, this would be beautiful with all the water buffalos walking around. I have been trying to see the Annapurna Mountains, I can see some big hills, but not much of snow capped mountains, the clouds are sitting on the city presently for the last week. I do not like to Trek, however I have been doing some one-two hour people Treks around the city, or cultural Treks. Somehow, the Trekker have guides, porters, and all sorts of things. The now have to pay a 2000 Trekker fee, then about 1000 for a Taxi somewhere, then I guess 500 for the guide per day, this is not a cheap walk on the side of a mountain. I think, or feel there is probably a very nice small village closer to the mountains that would not have the tourist and be a much better location to see the mountains than the city of Pokhara. I see Pokhara as just another in a long list of tourist cities and nothing unique about it however, it is 10-50 times better than Kathmandu, Nepal. Nice to have the beeping of the horns stop or less here, they really should now allow India or Nepal people to touch a horn, they just have to blow it every five seconds. I like Pokhara, I will leave tomorrow for Katmandu, and then fly to Delhi, a place that make Katmandu feel quiet and clean. I am ready for Africa where life is quiet, there is no tourist, and travel is easier and more refreshing. I think most of the information about Africa is crazy, it is a great place, easy to travel for the most part, or West Africa is, nothing close to what the media portrays.